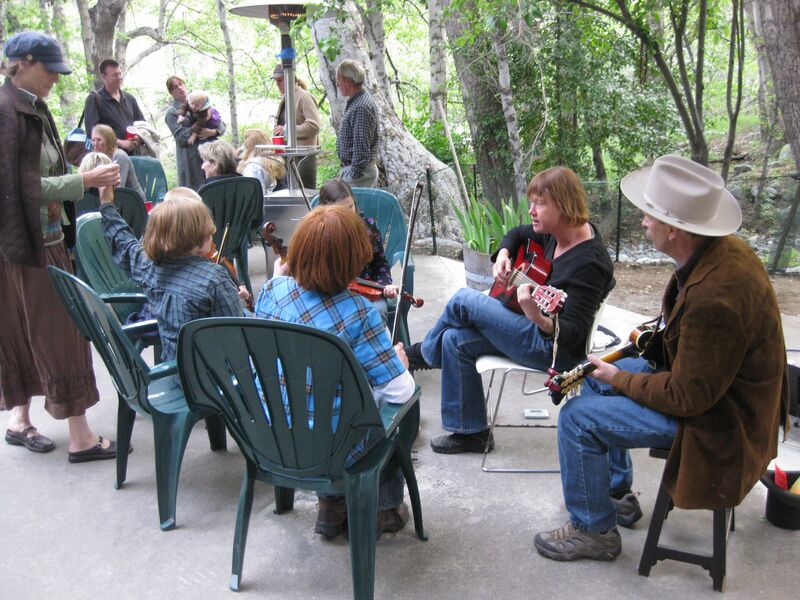 On Saturday, October 26th, 2013, from 2-8p, Belinda & Robbie will host a jam, square dance & potluck at their cabin near Mt Baldy Village, nestled among the pines at 5000 ft in the Angeles National Forest (about 1hr NE of LA). Our address isn’t in Google, so be sure to print out a physical copy of this map if you decide to come, as we live off a dirt driveway and cell reception is virtually nonexistent. This event is held outside, so decent weather is a prerequisite (feel free to email or call before coming if conditions warrant it; these contacts are listed in the above flier). As shown on the map linked to above, our house has 2 dirt driveways. Once you turn off of Mt Baldy Road onto one of these, you can park anywhere you like without a parking permit. The main thing we ask is that you do not block others’ ability to enter and exit … pull off to the side, park head-long when possible, etc. If folks are creative, there should be ample parking. If you’d like some help parking, feel free to temporarily park in the turnout on Mt Baldy Road right above our house (the 1st 180-degree switchback); you can then walk down to our cabin and talk to us or get a lay of the land before heading in. The jam runs from 2-4p. Bring your instruments, beverages or snacks, and a folding chair if you have one. This is an informal, mostly old-time jam that aims to be accessible, friendly, and fun (for more info, the format described here comes close to our aims). At the same time, we’ve played with African drummers, harmonicists, pianists, cellists, and the like … experimentation is encouraged! Besides, there’s plenty of space for multiple jams and this forest thrives on more than just old-time (i.e. swing, bluegrass, honky-tonk, cowboy tunes, and bluegrass come to mind :-)). New this time: Play during the 2nd half of the square dance with your own pick-up band. If you you gel with folks during the jam, you’ll have a chance to play for the dancers! 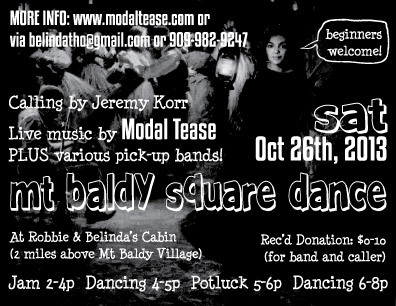 The first square dance set runs from 4-5p. 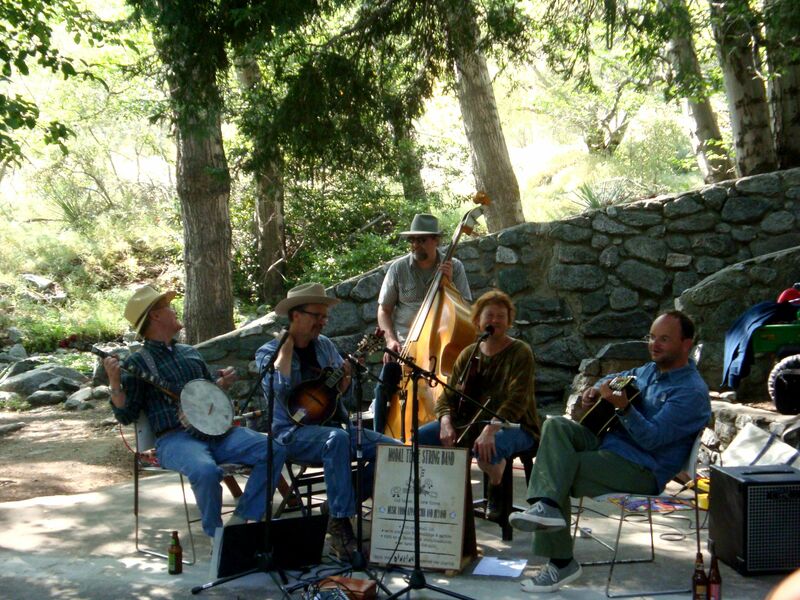 We dance outside, amidst the pines and a nearby creek, to live Applachian string band music. The square dance caller teaches each dance beforehand, so beginners and experts alike can participate. Jeremy Korr will be calling this time, a treat not to be missed. From 5-6p we break for a potluck dinner. We’ll provide condiments and paperware, you bring various entrees, snacks, desserts, and drinks. The second dance set runs from 6-8p, with opportunities for pick-up bands to play during the 2nd hour. In the past, I’ve heard that some folks don’t come because they’re pretty sure they’re not up for dancing. First of all: being a spectator is fine — the band, caller, and the dancers love an audience! 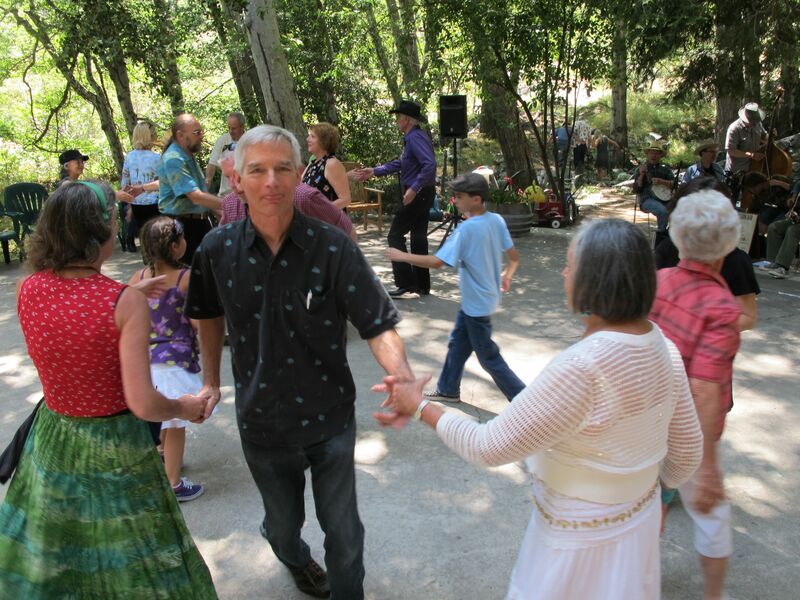 Second, square dancing is not difficult — there’s typically 10 or so straight forward moves (like “swing your partner” or “do-si-do”) that occur in various sequences — all directed by the caller throughout. Beginners are welcome and encouraged at anytime during the dance set, provided you start at the beginning, when a particular dance is being taught, and that you stay through the end of the dance, as each square needs 8 dancers to function. Efforts to have knowledgable dancers in each square are also made — folks who are enthusiastic enough about dancing that they’re delighted to help less experienced in the square as needed throughout the dance. We encourage families with kids to come. There’s a sandbox and shallow creek nearby and we’ve got our own 4 year old, so there’ll be plenty to keep your youngin’s busy. (Besides the more parents who show up, the more that can tag-team kid watching, enbabling other parents to dance.) Children of age 6 or so can even participate and family dances can be offered if there’s enough interest. We want everyone to be able to participate. At the same time, its nice to be able to compensate the band and caller for their efforts and travel expenses. For this reason, we suggest a $0 to $10 donation. There will be a hat to collect these donations on the premises. 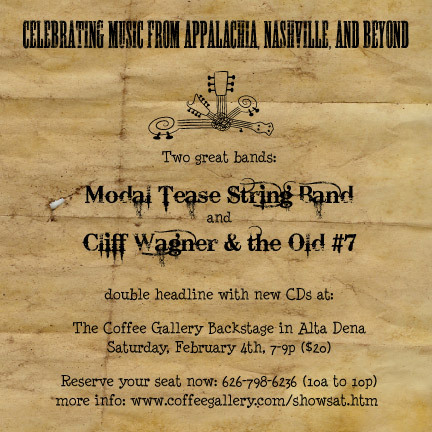 For those so inclined, Modal Tease String Band CDs will also be on sale. Our cabin is at 5000 feet, in the mountains. Please bring a sun hat, bug dope, comfortable shoes, water, and layers. There’s access to great hiking right from our front door, and there’s plenty of free parking available on our property. In such a frenetic world, this event is near and dear to our hearts. The goal is to nurture a community of music lovers, dancers, musicians, friends, kids, and neighbors, taking us beyond our hectic, digital lives into the present, physical moment for awhile. Please come and help make this day extra special! 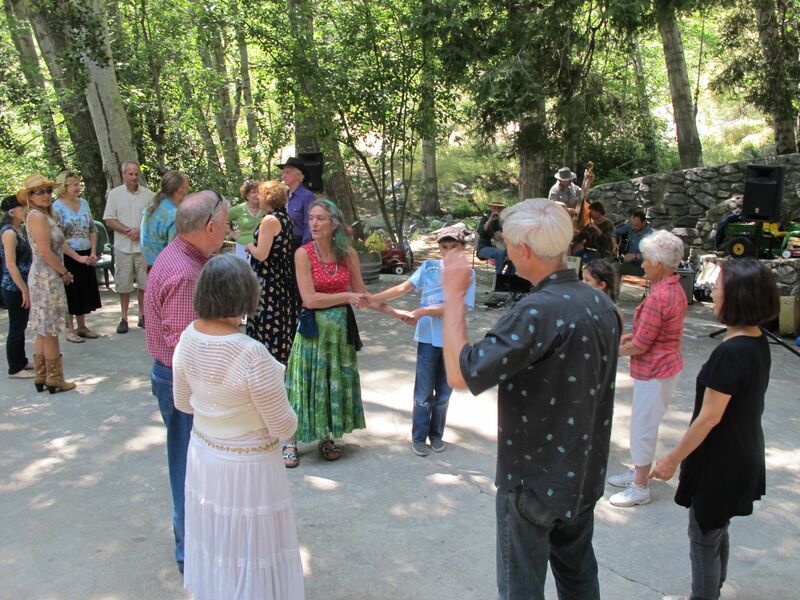 On Saturday, June 1st, 2013, from 2-7p, Belinda & Robbie will host a jam, square dance & potluck at their cabin near Mt Baldy Village, nestled among the pines at 5000 ft in the Angeles National Forest (about 1hr NE of LA). Our address isn’t in Google, so be sure to print out a physical copy of this map if you decide to come, as we live off a dirt driveway and cell reception is virtually nonexistant. This event is held outside, so decent weather is a prerequisite (feel free to email or call before coming if conditions warrant it; these contacts are listed in the above flier). The first square dance set runs from 4-5p. 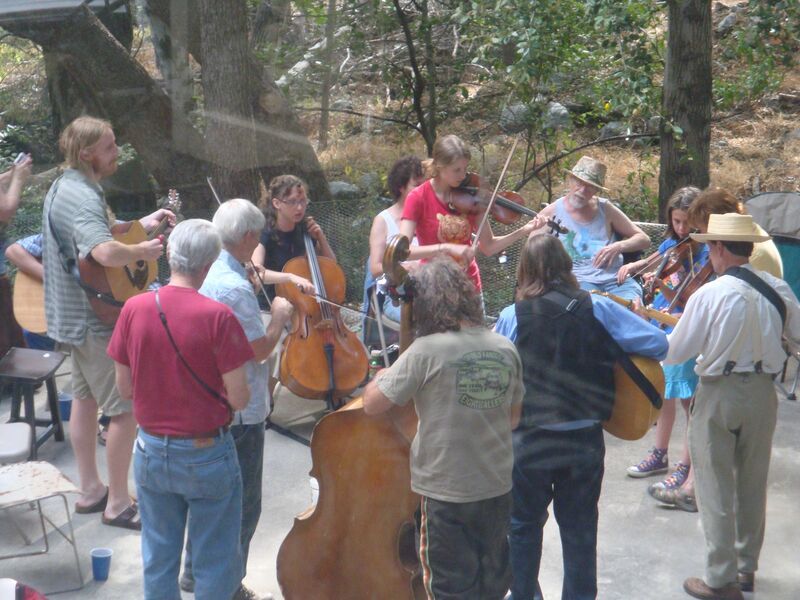 We dance outside, amidst the pines and a nearby creek, to live Applachian string band music. The square dance caller teaches each dance beforehand, so beginners and experts alike can participate. Susan Michaels will be calling this time, a treat not to be missed. The second dance set runs from 6-7p, with opportunities to jam amidst the trees following afterward. Greetings Fiddling and Modal Tease Fans! Was great seeing so many of you last month and hope you’re getting ready for a fantastical summer. This month is action packed, being So Cal’s premier month for old time and other fiddling genres too. 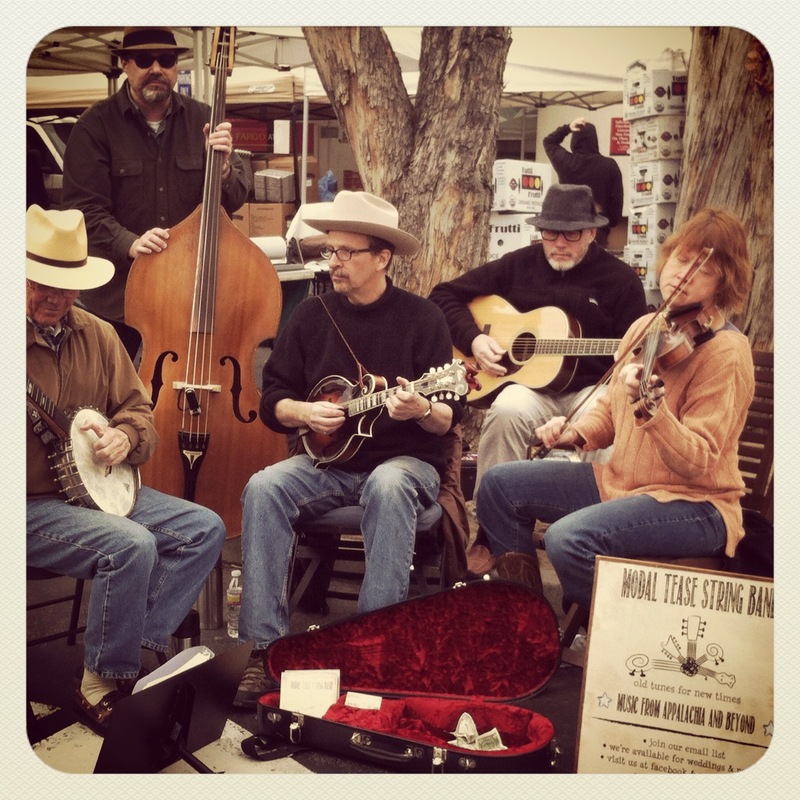 Want to make sure you’re aware of the 7th Ever Los Angeles Old Time Social and the Topanga Banjo and Fiddle Contest. Whether you make music or prefer to listen, these events are fantastic and we cannot recommend them too highly. 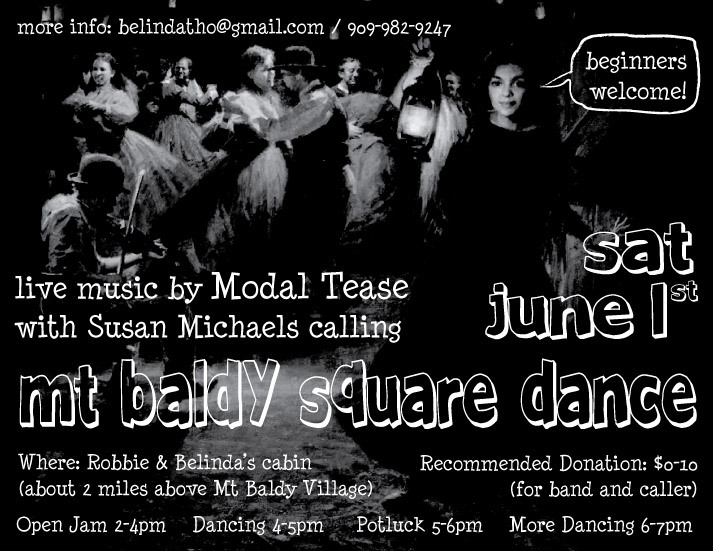 Also a heads up about June 2nd from 1:30-4:30p: its the 3rd Annual Mt Baldy Square Dance at Belinda’s cabin. 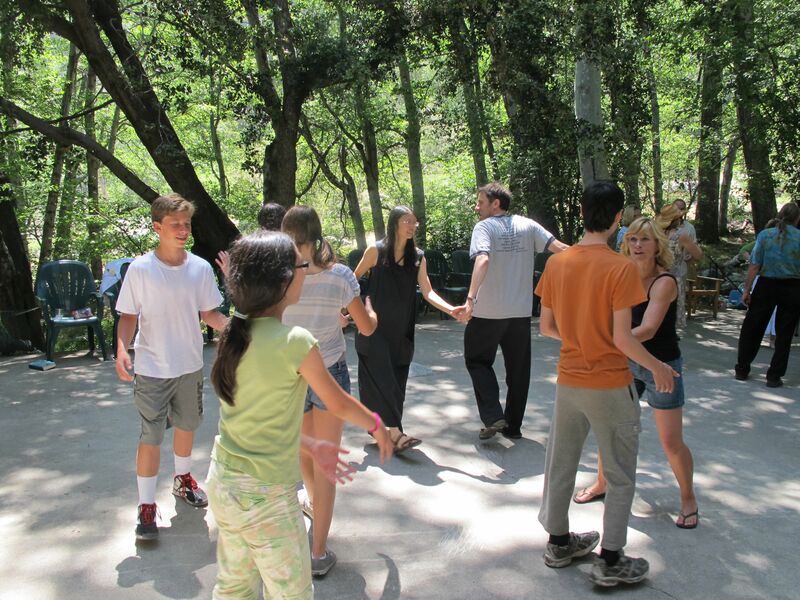 Come join us at 5000 feet for clean air, beautiful woods, a bubbling stream, great music, and your lively dancing. Be there or be square. Potluck and music jam to follow into the wee hours. Hope this post finds you and yours dancing around to fine tunes and enjoying the snow that’s finally taken up residence in Mt Baldy. What great views! No fooling — tomorrow, April 1st, 10a-1p — we’ll be at the Atwater Farmer’s market, making up for the gig we canceled last weekend because of rain. Come out; we’d love to see you. Fri April 6, 5-7pm, we host the old time jam at the Fretted Frog in Echo Park (we usually host this on the 2nd Fri but this month’s special :-). Fri, April 13, 8-10:30p, we play the Motley Coffeehouse at Scripps College in Claremont. Student string band “Sweet Nothins” opens for us. Its a free show and a great venue so don’t miss it. NEWS FLASH! 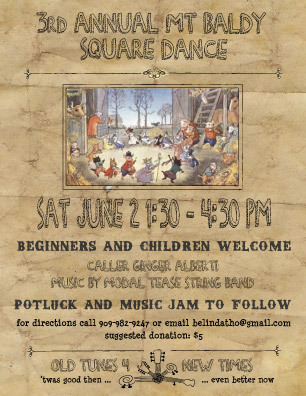 We’ve settled on the date for our 3rd Annual Mt Baldy Square Dance: Sat June 2nd in the afternoon, with a potluck and music jam to follow. Beginners and kids welcome. Please save the date so you can be a part of this tradition. Hope this email finds you and yours warm and healthy and enjoying this crazy summer weather (we keep wondering if there’ll be skiing in Baldy this year). In February we had an excellent time performing at the Coffee Gallery Backstage. Thanks to all of you who came out to see us. Playing for you made the evening magical and we were delighted so many showed up. Here’s some videos from that performance . 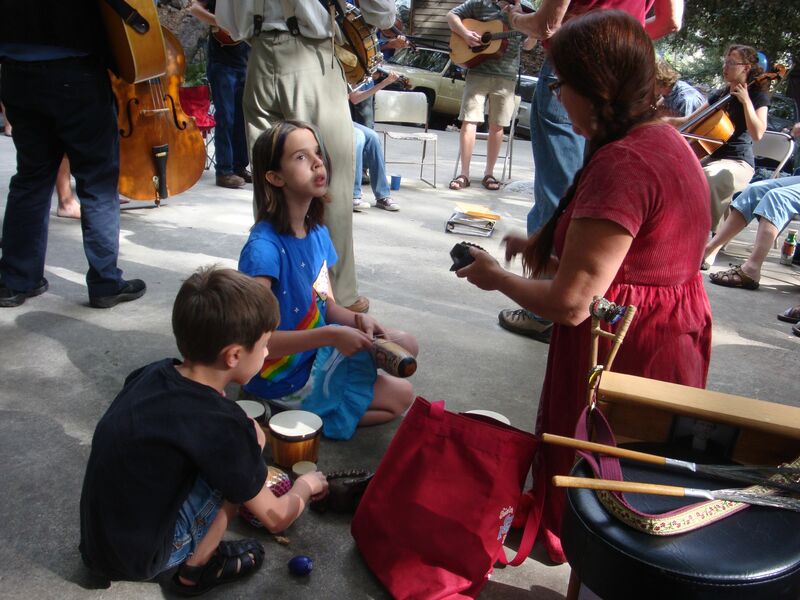 We usually perform at the Atwater Farmer’s Market twice a month (2nd and 4th Sundays). But today we didn’t make it out because TONIGHT we’re spending some time in downtown Claremont. Join us at the Claremont Folk Center (220 North Yale Avenue Claremont), where we perform as the featured guest (around 7:15p) for their open mic (6:30-9p). After, walk over to The Press (129 Harvard Ave., Claremont) where we host an open mic from 9p to midnight. In the first hour, we’ll perform some more mountain tunes and then open it up to the floor. Come join us! 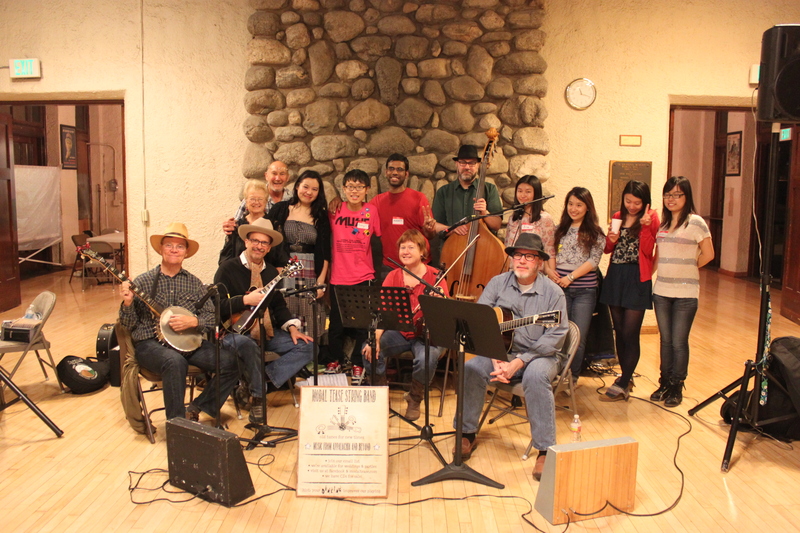 Here’s a picture from our Contra Dance in South Pasadena with Ginger calling on January 20th. It was a great crowd and we’ll be back in July so come dance with us then. Our website’s got new pictures and videos so please come visit and share with your friends! music with us in February! so we can demonstrate Music From Appalachia and Beyond thrives in L.A.
Reserve your seat as described in this poster and help us get the word out.